This bracelet was ordered as gift for daughter-in-law. I expected a very nice bracelet, but it has surpassed my expectations. The colors are just beautiful, and I am so excited to be giving her this unique gift that represents the grandchildren she has given me. 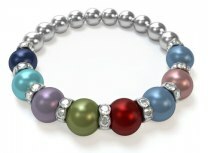 I was nervous to purchase this bracelet as I had not been able to see it in person, but it far exceeded my expectations! I am giving this as a Christmas Gift to my sister in law. It arrived well before the 3-5 day promised shipping. I love it so much that I have been dropping hints to my family that I would love to have one! So hopefully there will be one in my future. Thank you so much for a beautiful bracelet! It is much better looking in person than it shows on web photo. Very nice! I LOVE my mother's bracelet! I was very impressed with the quality of all the stones! I have received many compliments too! You can be sure that everyone knows where I got this!! Love it!! I wasn't sure how the bracelet would look in person, but I am very pleased with it. It is just beautiful! One question though, if I should have another grandchild would it be possible to add another pearl? Thanks!! !